Cody Glass is expecting to hear his name called early today at the 2017 NHL Entry Draft. It’s obviously a nerve wracking and stressful experience. Unfortunately, his trip to Chicago has already been a whirlwind. Coming from his hometown, Winnipeg, Manitoba, Glass was late to the media availability on Thursday afternoon but his first flight was cancelled because a hydraulic fluid cable snapped. He was able to grab the next flight into town but had trouble finding his way to the event. Since the event was a boat tour down the Chicago River, it was unable to leave until the top prospect made it. But he was worth the wait. Smart, poised and articulate, Glass presented himself as someone who was ready for the whole experience and ready to take the next step in his NHL career. “It’s something I’ve been waiting for my whole life. I know it’s going to be a really good experience for me and my family.” Glass remarked about the draft tomorrow. The young pivot entered the season as a possible late first round pick, or even second round pick. However, Glass shattered all those expectations and has vaulted himself into the conversation as a top 5 pick. He plays with poise, skill and speed that combines to give his fits in the offensive zone. Glass mentioned many times that he models his game after Boston Bruins forward Patrice Bergeron. Wanting to be that two-way force in all three zones. 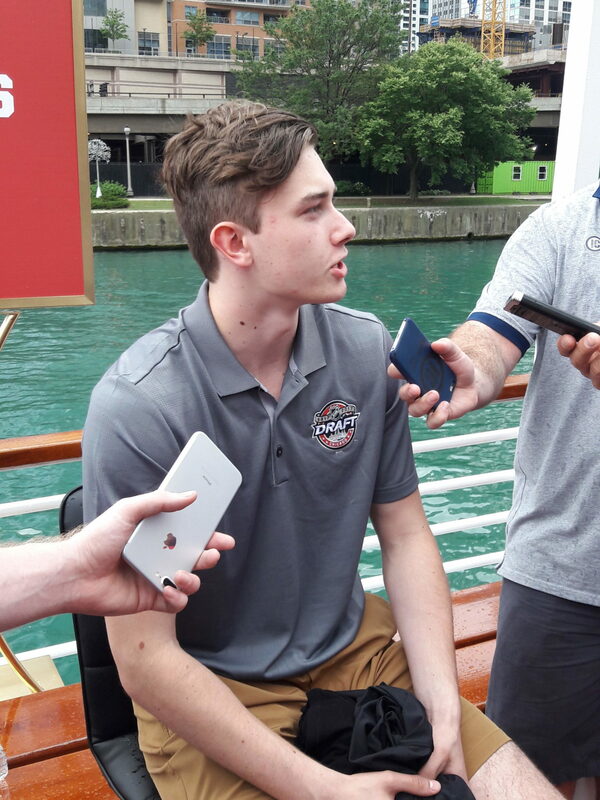 If Glass didn’t already surpass expectations this year with his 32 goal and 62 assists performance, the Portland Winterhawks will be getting reinforcements this upcoming season. Boston College forward Kieffer Bellows has made the move to the WHL and will join Glass in Portland for the 2017-18 season. It’s clear that Glass’ first goal is to make the NHL in October, but if he is unable to do so, he is excited about the proposition of playing with the American-born Bellows. Being cut from Team Canada for the Ivan Hlinka tournament to start the year was clearly a motivator for Glass this season. He worked hard on and off the ice to improve all aspects of his game. His ascension up the draft rankings is rightfully deserved as the young centre has a complete skillset that should translate to the NHL. The question now is which team will take the Winnipeg native.